Fall is in full swing, so it’s time to transition your skincare routine! With temperatures dropping and the air in transition, it’s important to remember to incorporate plenty of hydration into your fall routine. After all, proper hydration is the key to beautiful skin! Well-hydrated skin appears youthful, well-rested and radiates good health, whereas dehydrated skin is dull, flaky, cracked, and rough with an uneven surface and accentuated fine lines. No bueno. 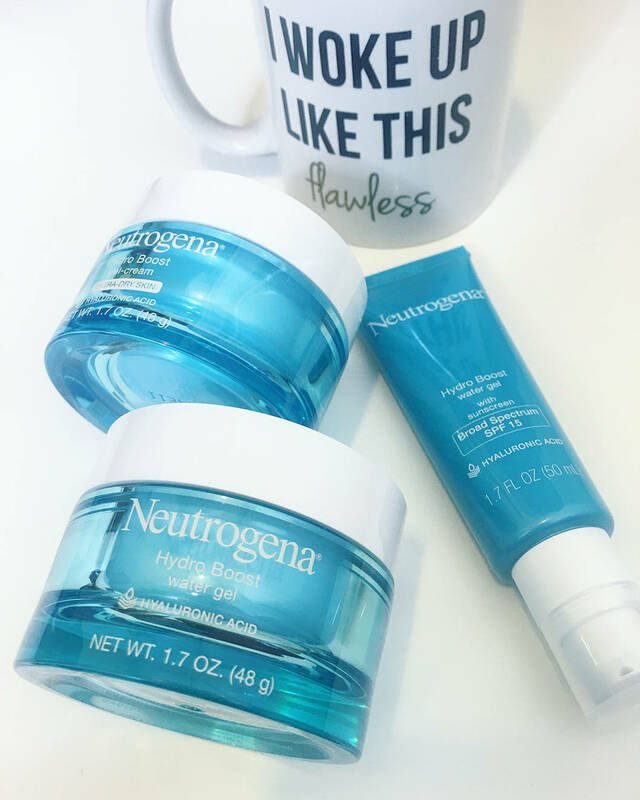 To make sure I keep my skin looking its best, I’ve been using the Neutrogrena Hydro Boost collection. I’m obsessing over the way it makes my skin feel! Purified hyaluronic acid acts like a sponge for dry skin cells, absorbing up to 1000 times its weight in water, progressively releasing water back into skin. Olive extract, similar to your skin’s natural moisture barrier, it integrates into the skins barrier to fortify and protect it from excessive moisture loss. Glycerin rebuilds lost mortar in the brick wall of your skin cells and replenishes the moisture barrier. The Collection consists of the Hydro Boost Water Gel, Hydro Boost Water Gel with Sunscreen Broad Spectrum SPF 15, Hydro Boost Gel-Cream for Extra-Dry Skin, and the Hydro Boost Gel-Cream Eye. I apply the Hydro Boost Eye Gel and Hydro Boost Water Gel daily after cleansing my skin under makeup for an oil-free, smooth complexion. At night, I moisturize with hydro Boost Fragrance Free Gel-Cream, used for extra-dry skin to relieve intense dryness and restore skin’s moisture. For additional info, don’t forget to follow Neutrogena on Twitter, Instagram, YouTube, and Facebook!